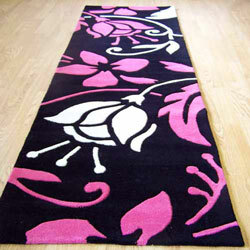 Infinite Damask runners, ideal for your hallway, landing or areas that require a long modern runner. Infinite Damask runners are quite simply stunning, this modern range features ultra fashionable colours in a popular damask pattern. Each runner is hand-tufted in China, the pile is made from soft heavy weight acrylic, hand carving the pile gives this runner a textured look.